One of the difficulties in finding sound advice for staying healthy is that there is a great deal of bunk floating around, to put things mildly. This can take the form of diet fads, miracle foods, and in some cases, the idea that microwaving food is bad for your health. 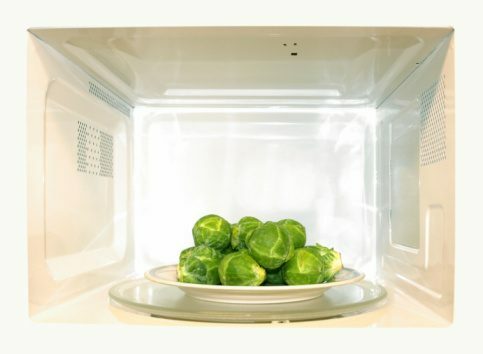 Some of the claims floating around about microwave cooking include the ideas that it destroys nutrients, releases carcinogens, can damage your blood from the radiation, and other scary-sounding claims. The good news is that these concerns are easily assuaged with a healthy dose of sound science. Rest assured that microwaving food is completely healthy (or at least not unhealthy), and the explanation of why is below. This is one of the trickier claims to explain because it is technically true in the sense that yes, microwaving does affect nutritional content, but not in the way those making the claim think. Nutrients will break down in response to heat, and they do not care what the source is. Whether you use a gas oven, a microwave, a campfire, a Bunsen burner, or just leave your broccoli on asphalt on a hot day, some of the nutrients are going to go away. Three factors affect how strongly this happens: level of heat, duration of heat, and water content. The last one is arguably the most important since boiling vegetables (or any food) causes more nutrients to leech out into the water. Now, if you are already familiar with anti-microwave claims, you may already be aware of this study (http://onlinelibrary.wiley.com/doi/10.1002/jsfa.1585/abstract) that appeared in the November 2003 issue of the Journal of Science of Food and Agriculture. The article is often reported as saying that microwaving broccoli removes up to 97% of its antioxidant flavonoid compounds. The thing to keep in mind, however, is that the broccoli was microwaved after water was added to it. It was boiled. Other (https://www.ncbi.nlm.nih.gov/pubmed/19397724) studies, which did not add water, have found that microwaving is actually one of the better methods for preserving antioxidant content, along with griddling and baking. This is because microwaving is often faster than other cooking methods and limits the duration of heat exposure. In other words, heating food can cause some nutrient loss, but microwaving is actually one of the least guilty offenders among cooking methods. Additionally, this claim ignores the matter of bioavailability, which is how much of a nutrient is actually absorbed by the body. Cooking (microwave or otherwise) helps break down proteins and cellular components and nutrients so that they are easy for our bodies to absorb and digest. This can most easily be seen in carrots, where cooking significantly increases the amount of beta-carotene that you absorb from the food. Incidentally, you may also be aware of that one 2006 science fair experiment where a student gave a plant microwaved water and it ended up dying (compared to a healthy non-microwave water one). To quickly summarize: it was a single plant, there are a spectacular number of non-microwave reasons why the results happened, and when Snopes (http://www.snopes.com/science/microwave/plants.asp) tried a much more controlled replication, all of their plants thrived. This claim relates to the plastic containers that a lot of microwavable meals come in. Like the claim about nutrition, there is a small kernel of truth to be found. Also like the nutrition-destroying claim, that kernel doesn’t change the fact that the claim is largely misplaced. Heating any material increases the chance of chemicals getting pulled out of it. Since plastic containers can have certain carcinogenic compounds in them, it is logical to assume that heating food in such a container could cause these compounds to get into your meal. This can actually happen, but it is not a concern when dealing with microwavable meals. Microwave-safe plastic exists, and it is what these ready-to-heat meals are packaged in. If you are trying to microwave something in plastic and you can’t find a microwave-safe label, then play it safe and put the food in an inert container like glass or ceramic instead. Claim: Microwaves Can Damage Your Blood/Heart/Etc. First, a point of clarification. Microwaves are a non-ionizing form of radiation. This means that they are not capable of breaking molecular bonds, which is the source of radiation’s feared dangers. Due to the lack of ionization, the radiation itself is not going to damage your cells or harm your blood or give you heart problems. The caveat to this is that while the microwaves can’t harm you directly, exposure can heat the water in your body just like it can in food. This is a known hazard and is why microwaves are all shielded. The only risk comes from pressing yourself against the microwave door or using a much older or damaged microwave. Furthermore, radiation falls off with distance and standing just a few feet from a microwave negates all possible risk. As for the idea that eating microwaved food can cause harm, the concept is bunk. Microwaves aren’t retained by food—they don’t make it radioactive, they make it hot. The only danger is heating something too much and giving yourself a burned tongue, but that applies with any cooking method. Microwaving food is not bad for your health, and most claims against it fail as a matter of science. Although there are some kernels of truth related to the fears about microwaves, these bits of fact can apply to any heat-based cooking method, misconstrue the level of risk, or both.